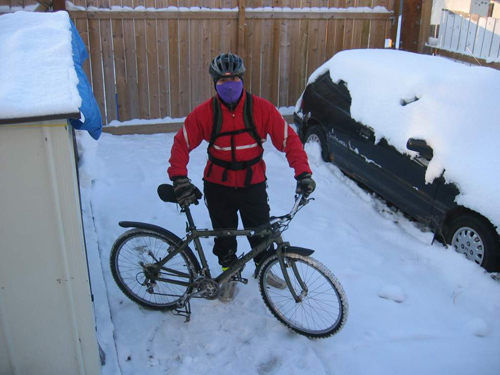 A couple of our faithful readers sent in some pictures to share of their winter bicycle commutes. Let me just say right at the beginning here that anyone who commutes by bicycle in harsh winter conditions has my undying respect and admiration — you truly ARE winter warriors! “Hello from the Prairies of Canada. Love the site. Just thought I might send something from Canada. I took the bike today, it was 5 degrees Fahrenheit at 6:30 am. Not as cold as I would like but it was cold enough. Check out the picture. That is real snow. I had my first brush with real cold here in Florida last night on my way home…perhaps the coldest ride I’ve taken in 15 years — it was 28 degrees with 15MPH+ gusts. That probably doesn’t seem like much to you winter warriors out there, but for me it was brutal. I guess my blood is really thin or something! 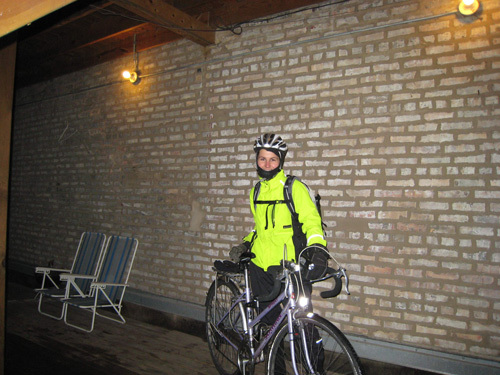 A t-shirt, lightweight wool sweater and a windproof Fox Racing jacket were all I needed to keep my body warm, and I had winter gloves and a balaclava under my helmet to keep the rest warm. Flannel dress pants, though, were not enough to keep my “boys” toasty. I imagine if I had to ride in conditions like this more often (instead of once or twice a winter), I’d invest in some windproof pants to keep the chilly breeze away from my junk!!! Ha ha…I had to throw that in there to make sure y’all were paying attention! Anyway, I wish you all safe, happy and warm riding this winter — keep on rolling, you winter warriors! You guys are inspiring! wow! By the way, what type of gloves and foot protection do you wear to keep them from going numb? I’m commuting in Colorado. I got a pair of these, http://www.pricepoint.com/detail.htm?stylePkey=14406, to cover my shoes and wear wool socks and that keeps me fairly warm. I don’t have any cycling specific gloves but I’ve been wearing snowboarding gloves when it’s really cold. Here in Montana it was 15F yesterday morning. ( below zero ). ski goggles work well also. It’s really important for me to not overdress and then overheat. In my backpack I carry lighter gloves and a lighter hat. I love 4 season commuting, tearing through a new snowfall. ( it’s fun until I hit a patch of ice under the snow and crash). I ride a Kona dew deluxe with Kenda Kross supreme tires and I love the stability in the snow. It was in the single digits today when I rode out….brrr… I may be a winter warrior, but my fingers and toes still get cold. Blame it on poor circulation to the extremities (that’s all my physician could tell me). I either wear my regular winter boots or NEOS overshoes in the sloppy weather. As for my hands — REI mittens I’ve found work best for keeping me warmest so far; still my thumbs suffer. Plus, I’ve invested in those disposable hand warmers for the coldest of days. Got any other suggestions??? Jack, I commend you for riding in the below freezing temps — it’s not easy. Seems like a lot of folks put platform pedals on their winter commuters and just ride with winter boots to keep their toesies warm…that’s the patented Kent Peterson method, at least! It was 9 degrees on the commute into work yesterday here in Denver. THICK wool socks, windstopper tights, homemade wool knickers, rain pants (for the wind), riding jacket, full fleece, long sleeve jersey, ski gloves and clear protective glasses. Cool but not freezing and especially not sweating. Another good hand-warming method that I use: glove liners with full-fingered cycling gloves. For those of us living in temperate climates, ski gloves are not something we necessarily have lying around the house…but I have glove liners (for running in colder temps) and full-fingered Fox mountain bike gloves. I combine the two and it keeps my hands plenty toasty in the 30 degree weather I will see. Oh yes! Glove liners are a must. I own several pair of varying thicknesses. It’s the sub-freezing temps that still get me, though. How about wind breakers? I know in So. Cal. we don’t get the single digit temeratures. I use a windbreaker during this time of the season. It sure keeps me warm enough without overheating. I ride 9 miles one way. For gloves: I use leather gloves with a wool material inside. If my hands get hot, I can take the the wool gloves out of the leather glove. Dual usage. Shorts/Pants: I use sport shorts. I do get cold at first but with all the pedaling, I don’t feel it. You have my deepest respect for riding at freezing and below temperature weather. It would be fun to ride in the snow. Stay warm. Wooo! Tampa was 30F with a 20F windchill this morning and it made my 6.6 mile ride into work very interesting. The ride home was much better and sacrifices must be made to get the bikecommuters team rankings up at the bike journal. I dress in layers, used blue jeans and knee socks to keep the cold at bay. My “boys” are protected from the wind (and other fun things) as a bonus from the recumbent design. 6 Degrees yesterday, with wind chill plenty below zero. And that’s Fahrenheit. a nice thermal base layer, nice heavy cargo pants, balaclava, ski goggles, ski gloves, ski coat, and no less than two pair of socks were the flavor of the day, and it worked pretty well. Never gets cold enough where I am (1 hour N of SF) to not ride. However, this morning I decided not to ride — one inch per hour of rain and 50-60mph gusts of wind exceed my limits for riding. Hard to see. Hard to be seen. Some drivers are really stupid and scary in heavy weather. Even just walking the wind gusts were knocking the breathe out of me; I’m thinking they might’ve been enough to knock me over on a bike. Ironically, the campus I work at closed just after I arrived; due to the weather and a power outage. I had a commute last week that was -4 f for the morning and a whopping 6 f in the afternoon. 13 miles each way. Wow… I commend you guys riding distances greater than 10 miles in this cold…. my extremities usually just don’t survive for that length of time in sub-freezing conditions unfortunately. Today it’s 60 degrees in Chicago — YEAH!!! 🙂 The wind gusts could blow you over, though, if you’re not careful. anyone recommend a good mountain bike for riding in the cold and/or snow? Living in Colorado Springs, I ride a Trek Series 4 with disc brakes and knobby tires (although I am considering going to a smoother rolling tire when the tread wears out) for my three mile commute. I wear shorts and t-shirt down to about 40 or 45 degrees; below that I start layering up: wind-stopper fleece, wind-stopper pants, long socks. The balaclava comes out about 20 – 25 degrees and silk-weight thermals are not needed until it gets below 15. I haven’t really ridden below 10 degrees yet so we shall see what happens then. Nice to here about others that do the winter commute. I had my coldest commute so far last week, -26F with a -47 wind chill. 8 miles of that sure made me appreciate that cup of coffee when I got to work. Winter biking is fantastic nothing else quite like it. In response to Elizabeth’s question to a good bike for winter/snow riding. Last summer I purchased a Redline monocog 29er. A great bike to bop around town here (in Michigan) but what really reaffirmed my buying decision was riding the bike after a heavy snow. What a blast!…No cars, no traffic..just me and my trusty steed. What I intended to be a 20 minute experiment turned into several hours of fun. I felt like a kid again. (I’m 44). After that episode, I continue to ride my bike to work (2 miles away). The 29 incg tires do a great job for attacking snow (or mud). Hope this helps. my current low temp ride was -35 degrees f. I’ve yet to find a temp that is too cold to mountain bike but that any colder than that on the road would be brutal.